The SC-3000 Survivors team is honored to introduce it! Here it is in its splendor: The SEGA SC-3000. Compact design, fine and very elegant with futuristic lines. It has a flat rubber keyboard, soft and silent while typing. Thanks to the function key you can type entire BASIC commands at a time, with the press of only one button, speeding up the typing of programs. The SC-3000 Computer was released in 1983 by SEGA in Japan and then all over the world, but only in a few countries became very popular. It became a competitor of many others 8 bit based computers and its popularity was different in each country it was introduced. It was mainly sold in Japan, and two important overseas markets: Australia and New Zealand. It has found a little distribution in South Africa, Italy, and Spain. Probably there were also some sales in other countries but very little is known about this computer and it is difficult to find out precise information. The architecture of the SEGA SC-3000 was pretty advanced. It is based on the Zilog Z80 microprocessor, and it is equipped with several specific chips for video and sound generation. The absence of an embedded firmware makes it simple but flexible for future expansions like the SF-7000 Super Control Station. SEGA SC-3000 is mainly based on the hardware of SEGA SG-1000 console, all the games cartridges can be used in both systems. There are some cartridges of SEGA MARK III that can be read by SC-3000 also (i.e. The Graphic Board GB-800). These systems can only run with a ROM cartridge inserted. In these ROMS are stored all games and program applications, and at the power-on of the system all data are read and played. This computer has great features compared to its 8 bit based competitors. The different programmable chips (Video, Sound, and Peripherals) gave the user a good programming flexibility and power, especially if the machine language is used. The VDP (Video Display Processor), used in many MSX systems also, offers 4 main video modes, two graphics modes, and two text modes. It has many features dedicated to the sprites (32 independent sprites definition, attributes and movements), other dedicated to the background graphics. And one, unfortunately not implemented in SC-3000, let overlay another video signal coming from another VDP. The sound processor has three independent sound channels, and 2 separated noise and white sound generators. All of these channels have their independent attenuator. So it is possible to program the chip and play very good music. The Input/Output programmable chip let the user program how to read the keyboard, load and write data to the cassette tape and to the printer also. It can be possible to disable keyboard key press, or control Joystick movements or input/output to cassette tape interface. Drawings of the SEGA SC-3000. This is the top view of the SC-3000. Straight lines, dark shades and soft touch rubber keyboard. This is the back view of the SC-3000. Thin profile, connectors flush with the back panel. This is the right side view of the SC-3000. Thin profile, neat angle and low profile keyboard. This is the left side view of the SC-3000. Thin profile, neat angle and low profile keyboard. Measurements of the Unit are mainly: (W)35.3cm × (D)17.0cm × (H)4.5cm. The unit was produced and sold in three different colors in different world markets: Black, Red and Ivory. 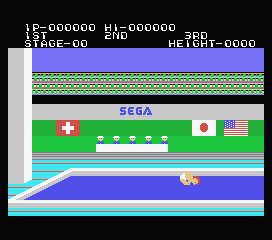 Japan: Black, Ivory, distributed by SEGA. Australia: Black, distributed by John Sands. New Zealand: Black, distributed by Grandstands Leisure. Spain: Black, Ivory, and red, distributed by SEGA. France: Black, distributed by Yeno. Other countries: Black, distributed by SEGA and Yeno. SC-3000 comes in different box layouts depending the edition and the distributors. Inside you can find the SC-3000, foam packages, user Manual, an AC Adaptor, RF Cable with a TV-GAME Switch (usually SEGA SS-55). No cartridges were included in the package. Here there are several photo galleries of SEGA materials related to the SC-3000.